I love love! I especially love photographing love!! I am really looking forward to this upcoming wedding season. Right now I’m offering a special for my remaining dates for 2014 weddings! 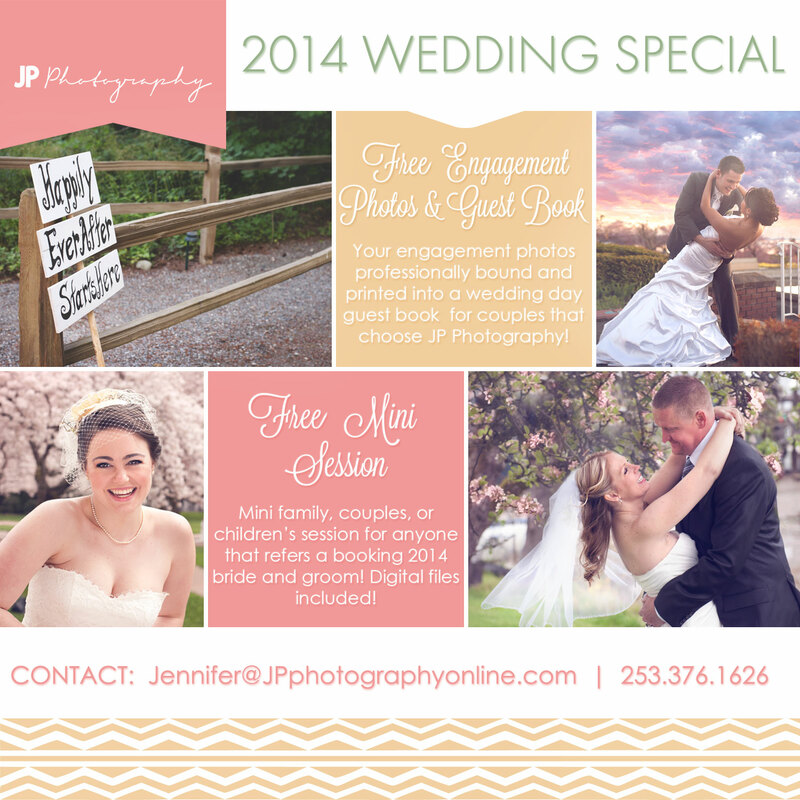 A great special for any bride and groom who choose JP Photography for their wedding!!! Free engagement photos professionally printed and bound into a wedding day guest book for couples that choose JP Photography! Guest book includes lay-flat pages and photos of your engagement session professionally bound into the book! A free mini session for anyone who refers a bride and groom that books with JP Photography! For more photos and information on JP Weddings, visit our website. Categories: Business Announcement, Wedding | Tags: 2014, bride and groom, Cherry Blossoms, engagement photos, federal way, free, gig harbor, Jennifer Parsons, jp, jp photography, landmark event center wedding, offer, outdoors, photographer, photography, pierce county, puyallup, rock creek gardens, seattle, seattle wedding photographer, Tacoma, tacoma wedding photographer, university of washington, university place, uw cherry blossoms, waterfront wedding, wedding, wedding guest book, wedding photography, wedding special | Permalink.